I love this stuff! I’ve made it for Birthday month here on Cakeyboi, but my goodness, it would be good at any time. 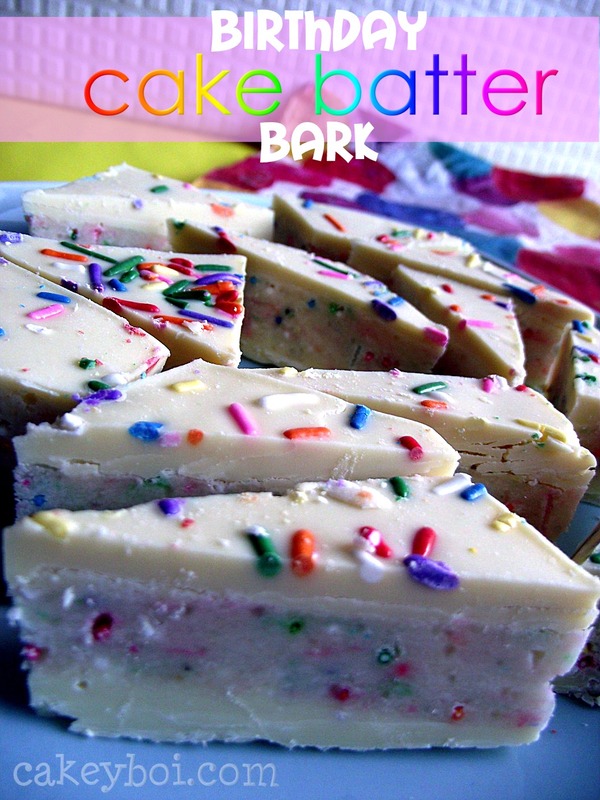 If you love cake batter and licking out the bowl, Birthday Cake Batter Bark is for you! I have made various versions of my bark over the past year, and they have all followed the same sort of format, with white chocolate and rice krispies. This bark is altogether different, but just as delicious. 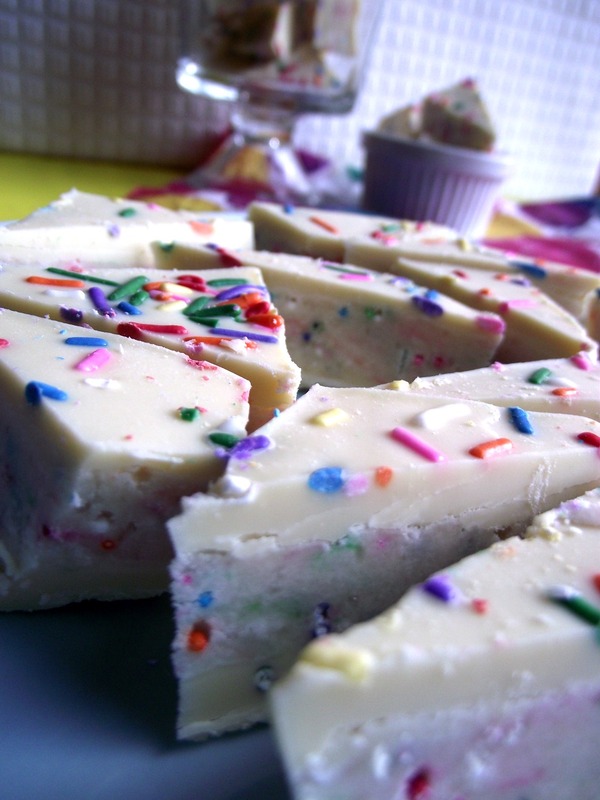 And it’s very simple to make, white chocolate on the bottom, a dough made from any boxed vanilla cake mix in the middle, (with added sprinkles) and a layer of white chocolate on top with more sprinkles. Line an 8”x8” square tin with foil. Melt 300 grams of the white chocolate, and pour this into the bottom of the tin. Smooth out so it is level and then place in the fridge to set, about 20-30 minutes. 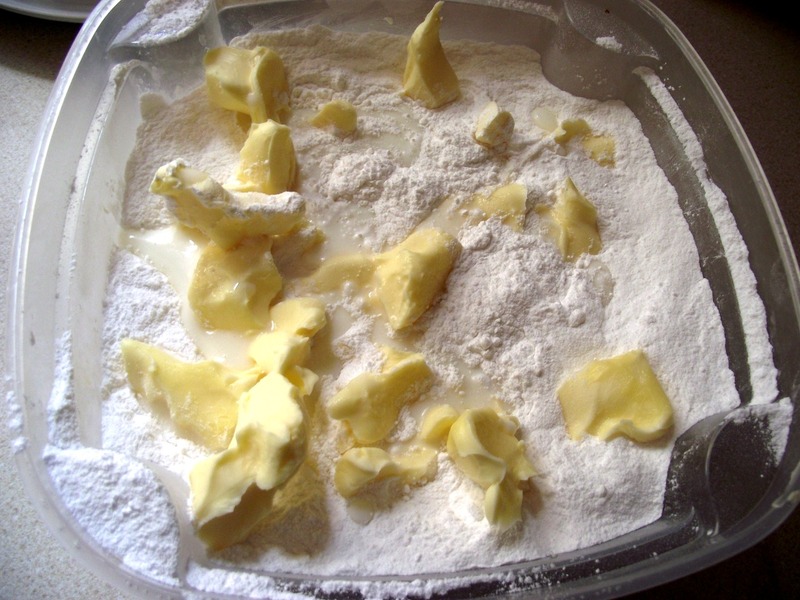 In a large microwaveable bowl, place the cake mix, icing sugar, butter and milk. Do not mix this, just pop it into the microwave for 2 minutes on full power (trust me on this!). After the 2 minutes, mix the contents with a fork until you get a thick dough. 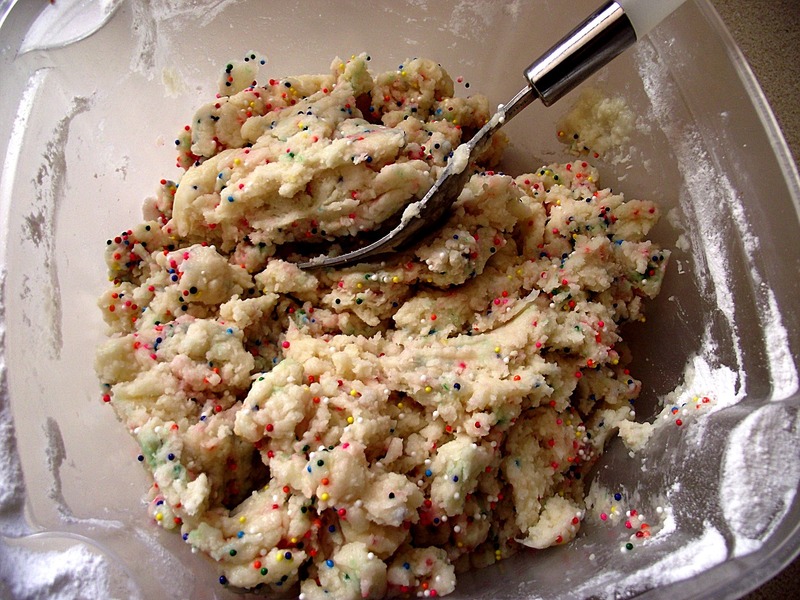 At this point add about 5 tablespoons of coloured sprinkles and mix through with the fork. Allow to cool a little, before placing the dough on top of the cooled chocolate in the tin. I found this easiest to do by grabbing handfuls of dough, flattening it, then placing it on top, adding pieces like a jigsaw until all the chocolate is covered. Don’t worry if the chocolate melts a little again, this helps it stick to the cake batter dough. Chill this for about 30 minutes. 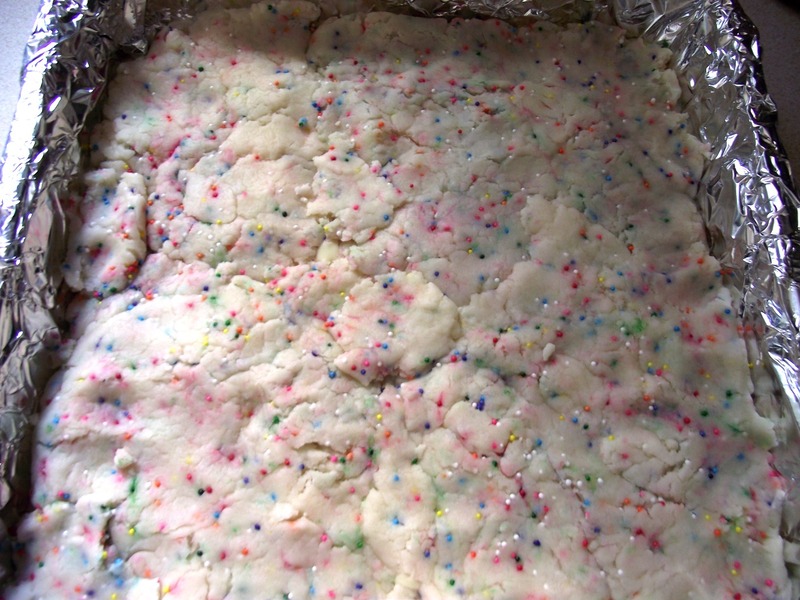 Melt the remaining 300 grams of white chocolate and pour over the top of the chilled dough, spreading to an even level and sprinkle on a couple of teaspoons of sprinkles. Place this into the fridge to set up, another 30 minutes. After this time, remove from the tin, carefully peeling the foil away and then cut into shards. I liked cutting mine into wedges as they looked like little mini birthday cake wedges. These are very sweet, what with the white choc top and bottom, plus the vanilla cake batter dough in the middle. But I’m not complaining and neither will you when you try them! Enjoy! I love the look of these! The sprinkles definitely make them pop. 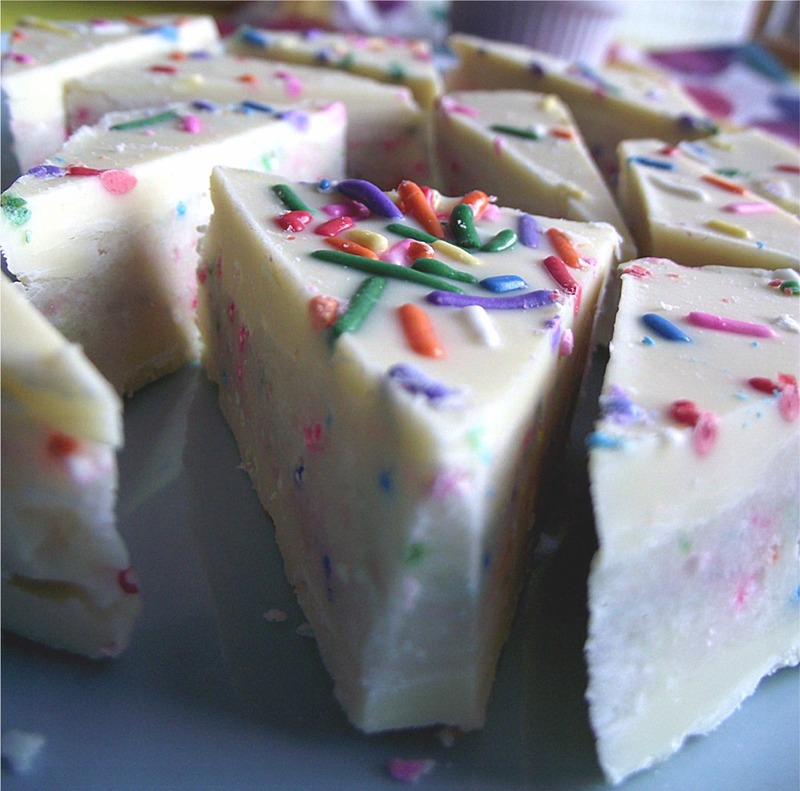 I will even buy boxed cake mix, which I've not done in years, to try this! Let me know how they turn out Janine - I hope you enjoy them! Looks yummy and very sugar coma inducing! Thanks ladies, certainly one to try! !